With the expert assistance of Dr. Jack Pollard of the University of Washington, Pride Surveys developed its Risk and Protective Factor (RPF) student perception survey, a hybrid version of the Communities That Care (CTC) Youth Survey and the Pride Questionnaire for Grades 6 to 12. 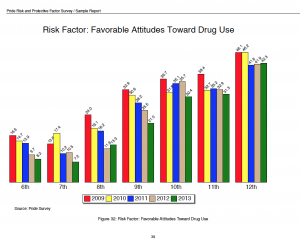 Dr. Pollard, who was instrumental in the early development of the original CTC Youth Survey, helped craft our student risk survey to measure the factor items that show the strongest correlation to drug use. 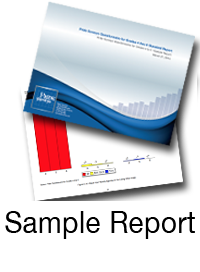 Appropriate for students in grade 6 through 12, the RPF survey report contains scale scores, familiar to previous users of the CTC Youth Survey, as well as percentage responses for each risk and protective factor item. 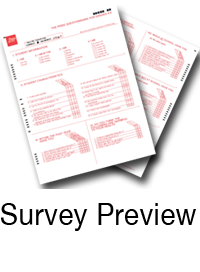 This four-page survey instrument can be administered by those who have used the original Pride Questionnaire for Grades 6 to 12, without loss of longitudinal core data. The RPF questionnaire is also appropriate for sites that have not yet conducted a student perception survey. It contains the updated Core Measures required by the Substance Abuse and Mental Health Services Administration (SAMHSA) for their Drug-Free Communities Grant that went into effect February 2013. For more information about conducting a substance abuse survey for students, or to learn about the many benefits of administering student questionnaires, contact our team today at (800) 279-6361. Ready to gain a better understanding of your school environment using our RPF student perception survey? Pride makes it easy for you to get started – simply call our team at (800) 279-6361 or fill out our convenient online form to order now!